China's population of 1.3 billion includes fifty-five official "minority" nationalities (i.e. non-Han peoples), 70 million people or 1.8% of the total, mostly found in Southern and Western provinces. These minzu, formally thought of as "primitive" people, have inhabited Han Chinese consciousness for centuries. The attraction of minzu for domestic Han tourists is sexually feminized (Schein 2000), with the significant exceptions of Tibetans and Uyghur who often self-consciously perform more "masculine" roles (Zhang 2009). Under Mao Zedong evolutionary development was promoted through education and technical advancements, and so-called "backward customs" such as polygamy, superstition and religion were banned. After 1978, closing the gap between minzu and Han has focused on poverty alleviation and selective assimilation through education and wage labor. Prime among these efforts is the promotion of domestic tourism to rural areas where ethnic "difference" is maintained through traditional performance and materiality, often ironically reviving formerly banned cultural forms. The paths to the commoditization of minzu culture pose challenges to aspects of Western social sciences. One path, stressed by NGOs and foreign advisors emphasizes, the visual retention of "authentic" material and performative culture (cf. MacCannell 1989), yet neither the mass tourists nor the ethnic performers feel such a need (Yang 2007). A second path heralded as a success to be emulated elsewhere, is the training of Yao farm families in Guanxi to run small hotels, shops and rural holiday villages almost free of "ethnic" content. 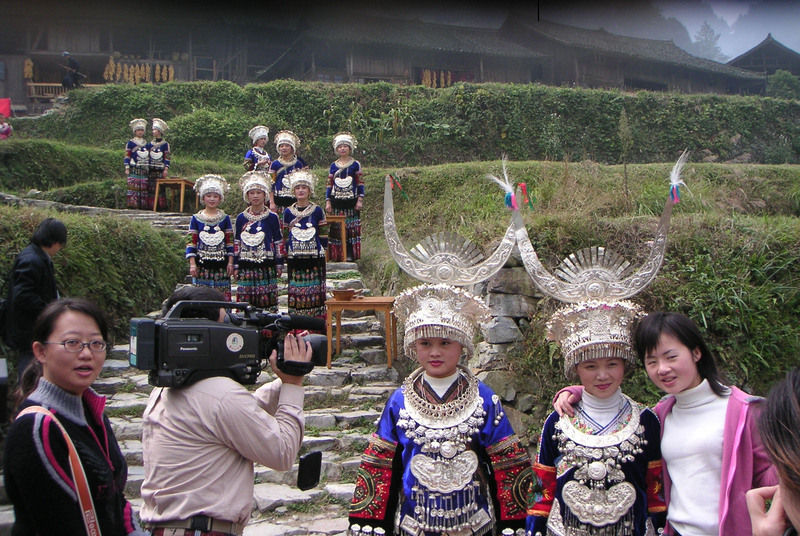 A third path, is the hyper-development of choreographed stereotypic ethnic performances in "folk villages" (Yunnan) and theme parks (Shenzen) in which the selected ethnic performers feel great professional pride (Jing 2004). Within the general policy framework, experimentation is encouraged and success rewarded as a kind of "cultural capitalism." Nelson Graburn (Co-chair 2012-2013) was educated in Natural Sciences and Anthropology at Cambridge, McGill, and University of Chicago. He is emeritus professor of socio-cultural anthropology at UC Berkeley, Curator of North American Ethnology at the Phoebe A. Hearst Museum of Anthropology, and co-chair of the Canadian Studies Program. He also recently retired from an appointment as Senior Professor at the International Institute for Culture, Tourism and Development at London Metropolitan University. Professor Graburn served as co-chair of the Tourism Studies Working Group in 2010-2013, and was a driving force in the organization of our 2011 conference, Tourism Imaginaries/Imaginaires Touristiques. Prof. Graburn has taught at Berkeley since 1964, with visiting appointments at the National Museum of Civilization, Ottawa; Le Centre des Hautes Etudes Touristiques, Aix-en-Provence; the National Museum of Ethnology (Minpaku) in Osaka; and the Research Center in Korean Studies, National University of Kyushu, in Fukuoka, Japan; the Universidade Nacional, Rio Grande del Sol, Porto Alegre, Brazil, the Nationalities University, Beijing, and Beijing International University. He is a founding member of the International Academy for the Study of Tourism, the Research Committee on Tourism (RC-50) of the International Sociological Association, and the Tourism Studies Working Group, and serves on the editorial board (for anthropology) of Annals of Tourism Research. Prof. Graburn's recent research has focused on the study of art, tourism, museums, and the expression and representation of identity. He has carried out ethnographic research with the Inuit (and Naskapi) of Canada (and Alaska and Greenland) since 1959. He is now working with the Inuit cultural organizations in Nunavik and Nunavut, Canada, on aspects of cultural preservation and autonomy, and on contemporary Inuit arts, including film and video-making. He has done research on tourism and social change in Japan since 1974, and with students and colleagues on tourism in China since 1991. In addition to articles and book chapters on ethnic and tourist arts, museums, modernity, identity, and theory and methods in the study of tourism, Prof. Graburn's publications include Ethnic and Tourist Arts (ed., 1976), To Pay, Pray, and Play: The Cultural Structure of Japanese Tourism (1983), and Relocating the Tourist (2001). Recent edited volumes include Multiculturalism in the New Japan, (2008), “Current Themes in Indigenous Tourism”. Special Issue of London Journal of Tourism, Sport and Creative Industries, 2 (1) (2009), edited with Alexis Bunten, and, Tourism and Glocalization: Perspectives in East Asian Studies, (2010) edited with Han Min.